Maybe it’s the Scotsman in me, but when the yearly cold-snap hits Edinburgh in late November, it always cheers me up. It’s the time of year when the weather changes from being mushy and wet into being cold and dry. Scarves and hats are no longer a choice to make, they’re simply required. So even the weekly trips up to Dundee become pleasant trips out in the brisk cold. Mind you, in weather like this, the office heating becomes a must. Thankfully, the Microsoft office, in all it’s newness, has great heating. Unfortunately, the heating in our office is less than stellar at the moment. Our part of the office is fine, but the people we share an office with (Alban Books), have little to no heat at all. They’re all huddled around electric heaters, and still cold for it. Worse still, the thermostat for the entire office is out in the hall, which is poorly insulated from the outside. So the thermostat is convinced that the entire office needs heating up, so our part of the office gets baked, and Alban and the hall remain frigid. And if I’m up at Ruffian, their heating is all screwy as well – with people wandering around with hats and gloves and scarves on all the time. But sadly I keep forgetting my hobo gloves, which are in the office with Tim! So Waverley Gate is the only place with a reasonable temperature at the moment. 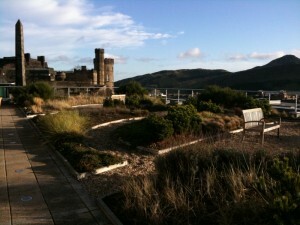 So to brighten up the blog, here’s a picture of the lovely rooftop garden at Waverley Gate. I don’t spend much time out on it, due to the aforementioned cold, but I do like to look out onto it while I’m making coffee or reheating last night’s leftovers for lunch. This entry was posted	on Saturday, December 5th, 2009 at 5:28 pm	and is filed under Tales from the grind-stone. You can follow any responses to this entry through the RSS 2.0 feed. Both comments and pings are currently closed.